I am actually glad that I came across this artist. WBHH maybe known for We Blazin Hip Hop (and R&B) but there is so much more than secular music. Add in the growing Christian/Gospel Hip Hop artists that are popping up wanting to help spread the word around about Jesus Christ. For the month of September I present to you ladies and gentlemen Emcee N.I.C.E. I am Emcee N.I.C.E. a Multi-Platinum producer/songwriter, Oscar associated by way of “Crash”, Actor co-star of the 3D animated 3D series on Netflix and Comcast/Xfinity called “Da Jammies” hailing from El Paso, Texas. I started out doing gospel hip-hop, but at the time it was being shunned by the church and was considered something at the time they didn’t want to embrace. So I ended up joining an R&B Hip-Hop group called “KansasCali”, we were RKelly & Jay Z before they were lol.. We busted on to the scene as producers when we produced 2 Pac’s acoustic version of “Thugz Mansion” that featured NAS and from there as group we landed on the soundtrack of the motion picture “Crash” that won the Oscar for Best Film, then we landed on 5 others most notable “Mr. & Mrs. Smith (International Soundtrack). I would go on to participate on over 30+ records that includes some TV shows, theme song for the NBA and more. The music scene in El Paso is thriving big time, Khalid (who’s from El Paso) just won Best New Artist at the VMA’s and is almost certain to win Best New Artist at the 2018 Grammys. Then you have Evander Griiim who just did records with Gucci Man, Lil Yatchy and more… Then there is Elia Esparza that I feature on my new Gospel Hip-Hop album, she was on The Voice Season 11 on Adam Levine’s team. You also have some other starting shine like Raphael Leraux and Mr. Southwest Prince Hawkins shoutout to Loza. 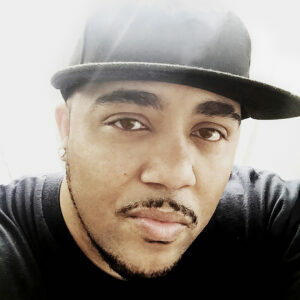 My music is Gospel | Gospel Hip-Hop | Christian Rap with a sound that reminds you of a 2 Pac meets Fat Joe (it must be the Puerto Rican in me) mixed with some R&B melodies. The current singles I am pushing is “I Got Angels” produced by Sam Peezy the sub bass monsta from Alabama! The song “I Got Angels” (inspired by Gospel Music Hall of Fame and Legend Richard Smallwood’s “Angels”) speaks on the many Angels that watch over us to keep us out of harm’s way, even though every day, the devil tries to sabotage everything you do and “On Your Way Up”featuring Elia Esparza (El Paso’s Latin Sensation from Adam Levine’s team on “The Voice” season 11). With the aid of scripture and soulful tones, the song speaks on God’s love and how he delivers us from daily adversaries and the evil the devil conjures in our lives. What goals do you want to achieve with in the next year? Next year I am just hoping to make an impact on lives through my music, for those that believe in God and or having trouble with their walk, I am here to remind them that no one is perfect and that we all have flaws. So if my music saves a life or inspires a life then I would have achieved the ultimate success. How did you come up with the name Emcee N.I.C.E? What is one thing people don’t know about you that you would like for them to know? I am a real Author lol I have a book out called “50 Shades of L.O.V.E. – (Learning Our Various Emotions)” by Aulsondro “Novelist” Hamilton. When I am recording a must is a Venti Soy Green Tea Latte from Starbucks along with a Classic Coffee Cake. It’s something about that combination that puts me in the mindset to get it in. In the future, I think it would love to do a collab, with Jay Z just because he’s a living legend, (how many players would love to play with MJ23?) Sade (arguably one of the greatest voices ever), Beyonce (The greatest female entertainer ever and her melodies are insane) and Redman (the Metaphor King!) all on one joint! That would be a crazy! Oh and one with Melanie Fiona & Dave East the future oh R&B Hip-Hop). GOD! Straight up, we all go through challenges in life and that there are other people going through some of those things too and have the same questions. I am not psychic lol but what I would like have established is many lives save and or motivated into action by my music. I would also hope that my music would inspire writers of music to engage a new mindset that allows them to be even more creative with the writing and not reliant upon words that allows them to be sensored. There is the freedom of expression but the powers that be have set rules in place that limits that expression, but if you are clever with your rhyme stylin’ and word play you can still tell your story.